August has meant a lot of grilled dinners and enjoying the daylight. I harvested all the basil and made some pesto. The little one loooved the pesto-pasta! Mr. J and I booked a trip to Zion National Park! SOOOO excited! We go in September and I’m really looking forward to it. I whipped up these Shrimp Cakes to go on a salad and they had the best texture. I made them on a Sunday and had some for lunch and the rest for Monday’s dinner over salad. They were perfect for my goal for dinner prep in advance! I was all about the breakfasts. 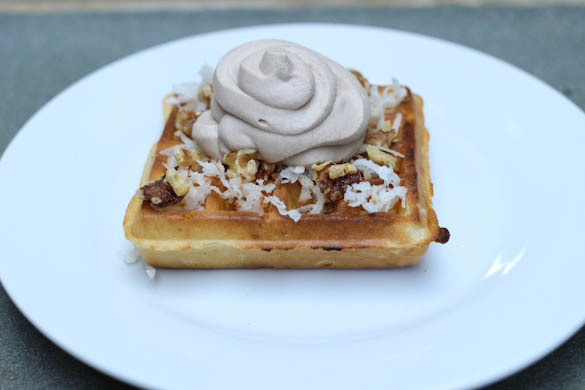 I used a frozen Belgian waffle with fun toppings for German Chocolate Cake Waffles, and then I made Peach Cornmeal Pancakes. 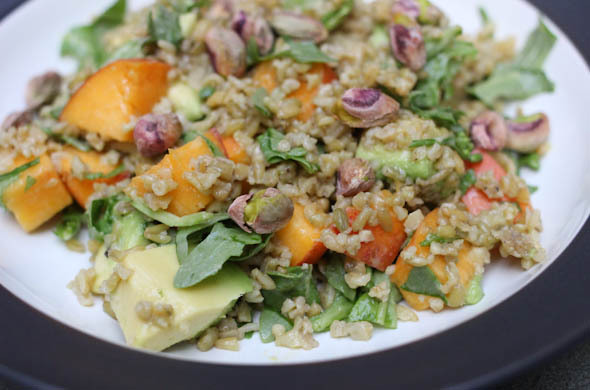 My fav meal of the month was the salad with cracked wheat, arugula, peach, avocado, and pistachios. The best! He’s such a big boy now! He remains waffle-obsessed and can’t get enough fruit. My 2nd cousins were visiting and Thomas ate the 6 & 11 year old under the table. He’s such a little sponge. He knows and remembers things – like we drive around a rotary on the way home and when we get close he says “goin’ round the rotary?”. He’s moving up to the pre-school classroom at daycare. I can’t believe it but think it’ll be good for him to play with the bigger kids. He is loving all the books and coloring with markers. All sticks outside are screwdrivers or hammers. Year of the seasonal decor: Ehh. I’m lacking on fall that isn’t pumpkins. do more dinner prep more in advance: Yes! 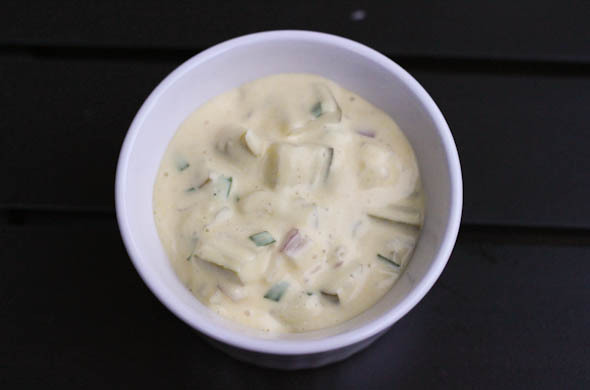 I made sweet pickle pasta salad to go with something grilled; I made shrimp cakes in advance; etc! read more (and always carry my book on me): I read started a few but didn’t get really into it. watch more movies: we watched The Founder, which was fascinating. 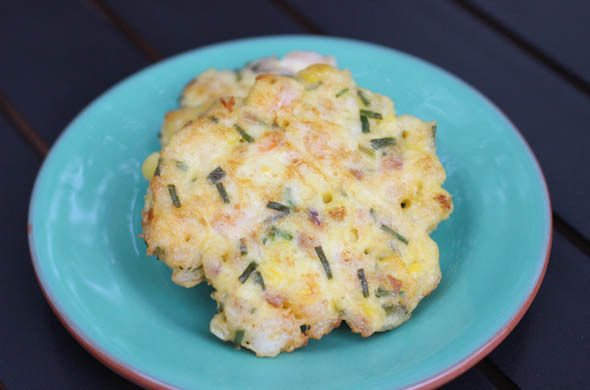 cook more fish: shrimp cakes! focus on clothes that I really like: I grabbed a few workout items for our big trip! I could eat this one weekly. 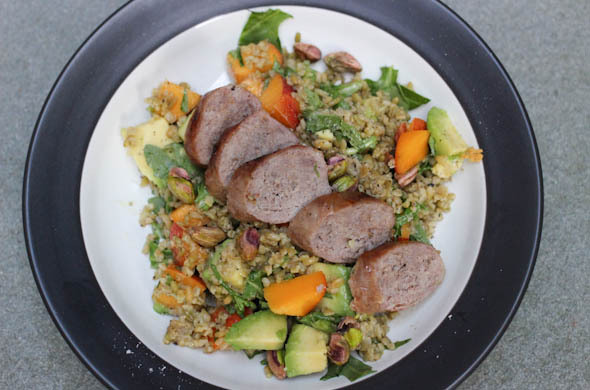 This salad has all the things: Nutty cracked wheat! Creamy avocado! Juicy peach! Peppery arugula! Crunchy pistachio! Do you know Simply Savory by Kate? You should! She made these curried pistachio and added them to a salad with peaches and avocado. Yum! I took a variation on it. I tossed mine all together with a touch of honey mustard dressing and grilled sausages on top. LOVED it. This would be a really great use of a leftover grain. It would pack well if the nuts and peach were separate until serving. 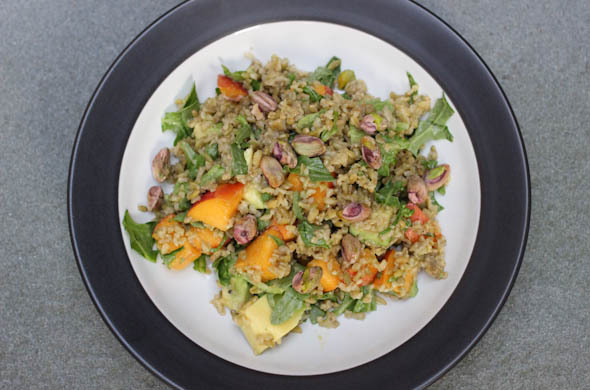 Chop the peach, avocado, and arugula and mix together with the cracked wheat and dressing. 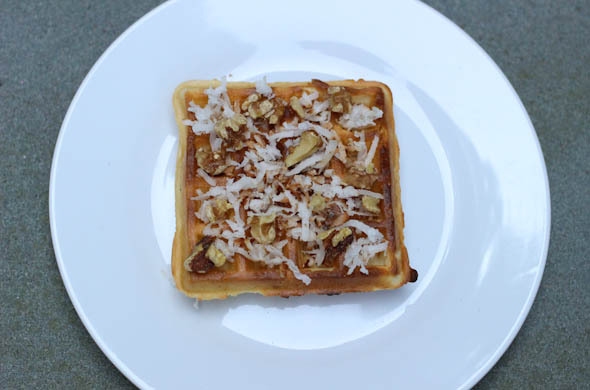 Then top with the pistachios. Slice the sausages to serve on top. Sprinkle with a little salt & pepper. This has everything. The grain makes it a filling dinner. I liked the stronger flavor of the greens since the peach is sweet and the arugula was creamy. Summer produce is in prime and I was wanting to make this snack but a fourth of a seedless watermelon seems like a lot when it isn’t anyone’s fav fruit at home. 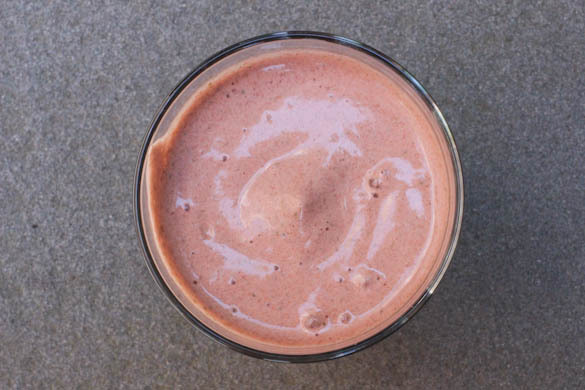 We gravitate to berries, cantaloupe and nectarines. It seemed like a good choice to bring to a BBQ to feed others though! 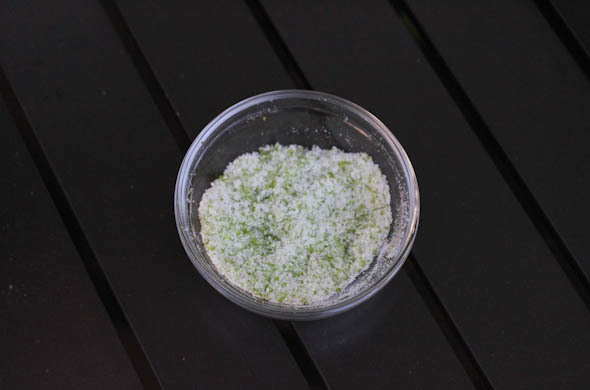 Zest the lime and mix in the sugar and salt. 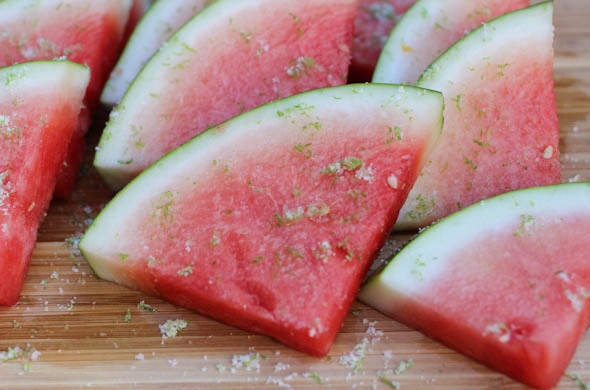 Sprinkle generously over each side of the sliced watermelon, serve, and enjoy! 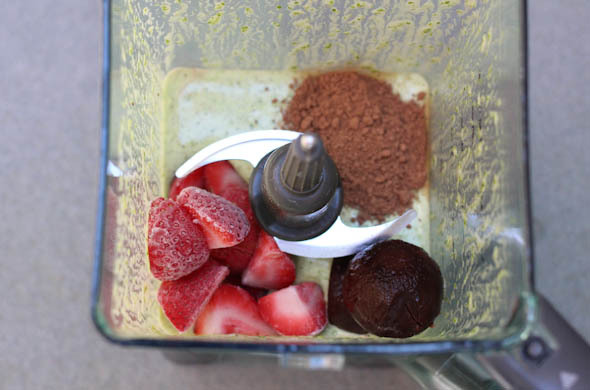 Not rocket science, but ohh-so-good. I love the lime and the salt with the watermelon. It was perfect for a warm day to eat outside – or any setting appropriate for watermelon juice to run down your arms! I brought it ready to go, but next time I might sprinkle the sugar/salt/lime zest mix just before serving. It’d be cute cut onto skewers for a mobile snack! These pancakes are what summer Sunday mornings are made of. Mr. J and the little one went to a bike path nearby and I had some time to myself! 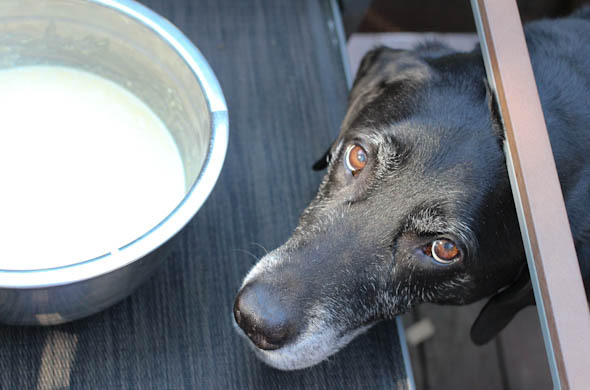 With my four legged sous-chefs, of course. 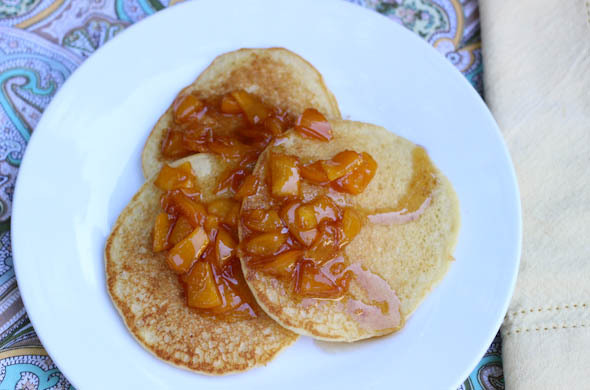 These pancakes are fluffy and have a cornmeal texture and flavor with juicy peach. I made a whole batch, despite eating breakfast by myself. I popped some into the fridge for later this week and the rest went into the freezer. 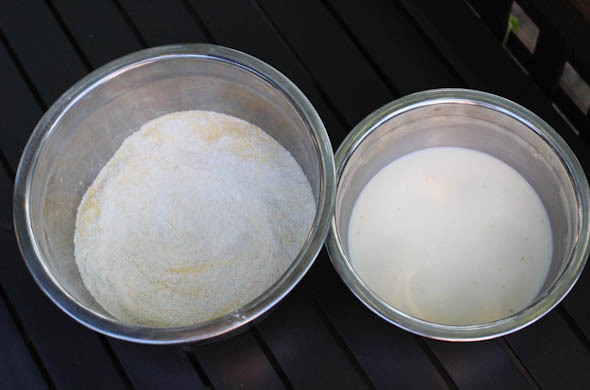 Mix together the dry ingredients: cornmeal; flour; sugar; baking powder; and salt. 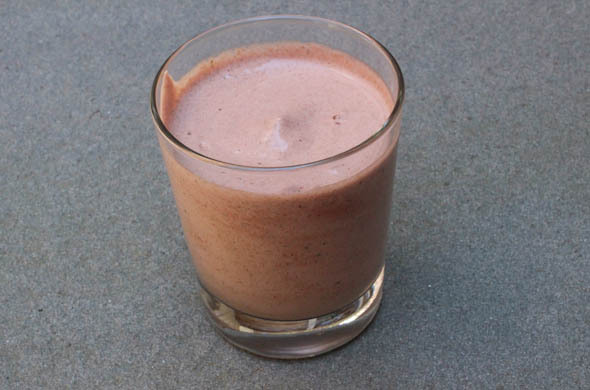 Mix together the wet: milk; cream; eggs; and vanilla. Then mix together the wet and dry – gently, and add in the melted butter and stir. Chop the peach/nectarine into thin slices then diced. Half goes into a small pot with water, sugar, and syrup to boil and thicken for about 5 minutes. Heat a large pan or griddle to medium heat and spray generously with non-stick spray. Ladle small scoops onto the hot griddle. Let cook for a minute or two and add in a few pieces of peach onto each pancake. Wait patiently for the pancake to bubble, puff, and get golden brown before flipping. 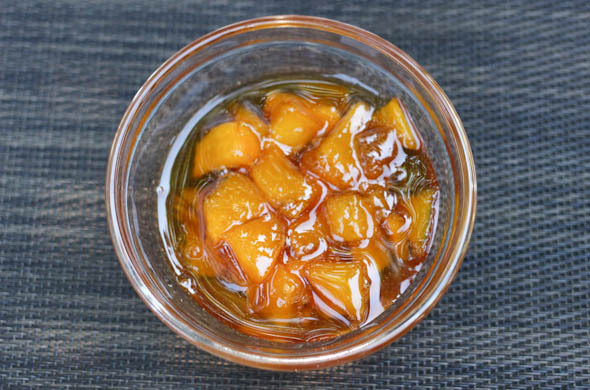 Serve with peach topping and extra syrup. My first two were crumbly messes. I didn’t let them cook long enough. Be patient. Do a yoga position and some breathing before trying to flip. They get delightfully golden and crispy…if allowed to cook enough. 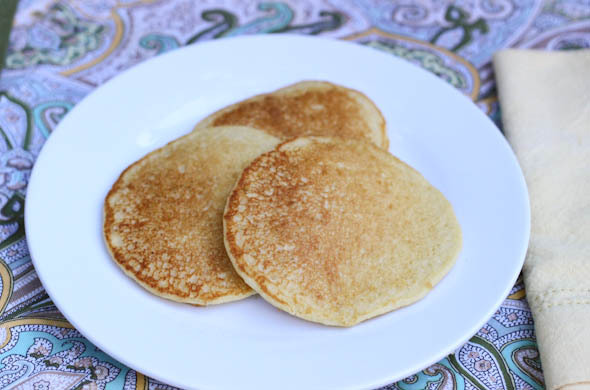 If regular pancakes take 2 minutes, these take 5. Mr. J wasn’t into pickles until he had a bread & butter sweet pickle a few years ago. Now he wonders where they had been his whole life! 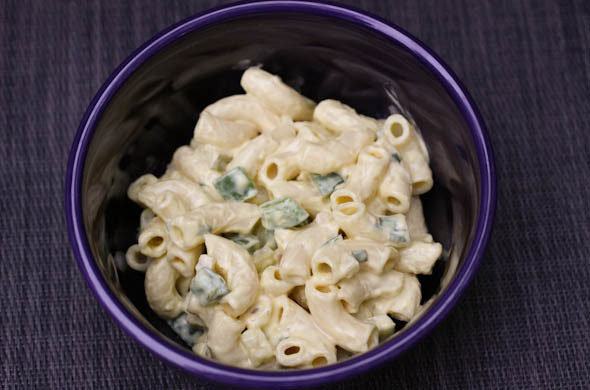 I mixed up this sweet pickle macaroni salad as a side dish using not only the pickles, but the pickle “juice” for the dressing. It was an easy side to prep the night before for a faster week-night meal. Boil salted water and add the pasta once it comes to a boil. Cook according to the package. 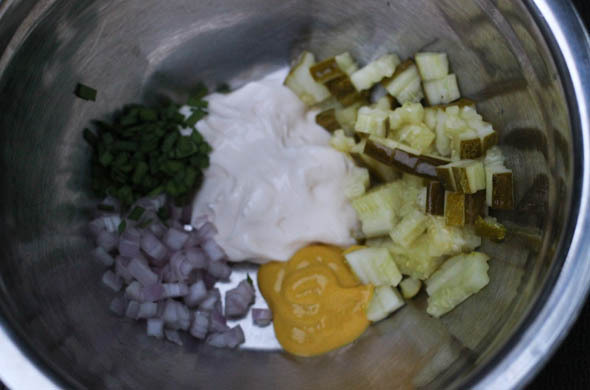 Mix together mayo, mustard, pickles, shallots, green onions, and pickle juice. 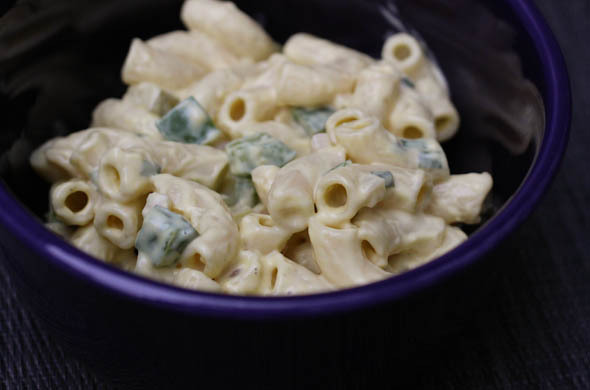 Stir well and toss with the cooled pasta. 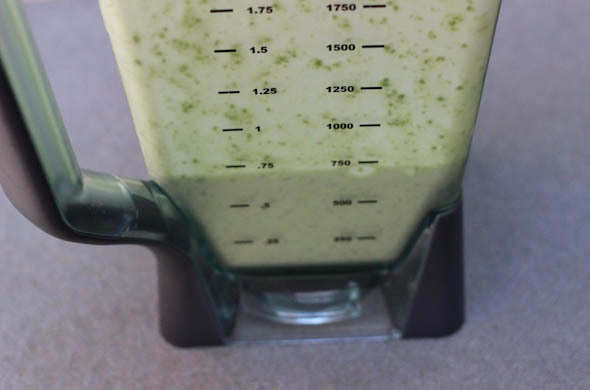 When ready to serve, mix in the green pepper. I almost mixed in a hard boiled egg, but ended up sending that as the little one’s lunch. This was good and the sweetness was good with a grilled dinner. I had another post queued up but was just so psyched by this one so it is cutting the line! I loooove shrimp and went all out – even pan frying these! Gasp! I tend to get annoyed frying things since they require so much babysitting. These stayed together pretty well and were worth it. The shrimp cakes were full of such great corn & chive flavor! Plus if you’re growing chives, chances are you have tonssss – or sub parsley, or green onion, or whatever herb suits you. 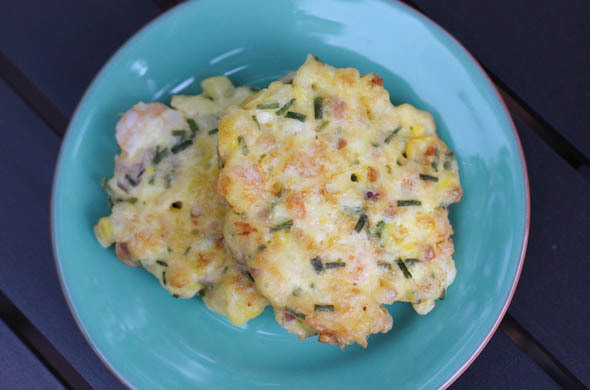 These shrimp cakes have a touch of lemon and some sweet corn and shallots provided freshness and crunch. My corn was leftover and I used some frozen shrimp since I like to have them on hand. I’d totally whip a bunch of these up for a group, or as mini appetizers, or they were great to just make 2 servings. Rough chop the shrimp into approximately thirds – smaller pieces but chunks. 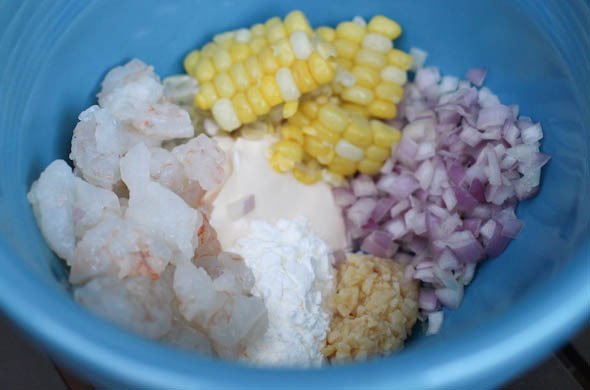 Add shrimp, mayo, cornstarch, garlic, chives, shallot, corn, lemon juice, egg, and salt & pepper into a bowl and mix well. Test the oil temperature by dropping in a tiny bit of the mixture. If it sizzles, spoon in about 3 tablespoons for each shrimp cake (or your desired size). Pan fry for about 3 minutes on each side, or until golden brown. Remove from the oil to a paper-towel lined plate and sprinkle with salt. I made these on a weekend afternoon and ate some of the more crumbly ones as lunch then the next night for dinner I just toasted these through and had them on salad for dinner. I looooved that these were full of shrimp and corn. I also really didn’t want them full of filler. I love me a good crabcake but wanted these to be different. The cornstarch makes them puffy and crunchy. Make sure that oil is hot…otherwise they’ll be greasy and not crisp. I go with the small pan to just do a few at a time. Pop the done ones in an oven to stay warm if making for a crowd! I’d do little bites in advance for an app! I froze half, despite the fact that I’m compulsively trying to use up frozen stuff. I just didn’t want to eat it twice in a week given the warm forecast but I can see popping it out for some not-hot night for variety of the many grilled dinners we’re having this summer! In a dutch oven, cook the bacon until crisp and drain. Then brown the sausage and drain. Then saute the onion until cooked through. 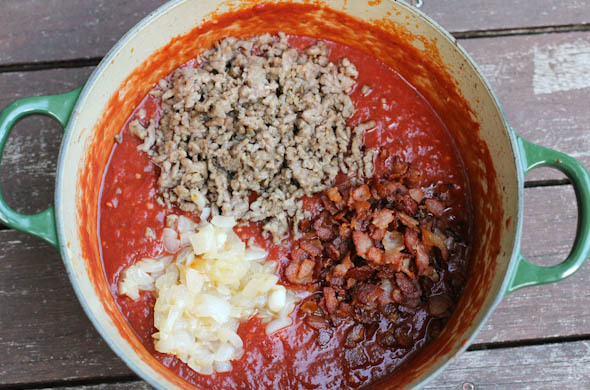 Add the crushed tomatoes into the pot, add in sausage, onion, bacon, garlic, and liquid smoke. Cook over medium heat for 15 minutes and add in the red pepper flakes, onion powder, Parmesan, a sprinkle of salt and pepper, and basil. Stir well. Reduce to low and cook for another 5 minutes. Boil the pasta and cook to al dente. Spoon sauce over the top and enjoy! I loved it. 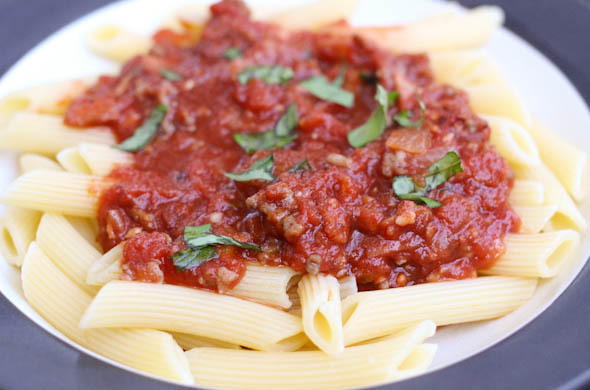 It definitely wasn’t your average tomato sauce. The salty and smoky flavor came out and I took great care for it not to be greasy. Bacon & sausage needed to cook separately to each get to their best. Each needed to be drained, for sure. 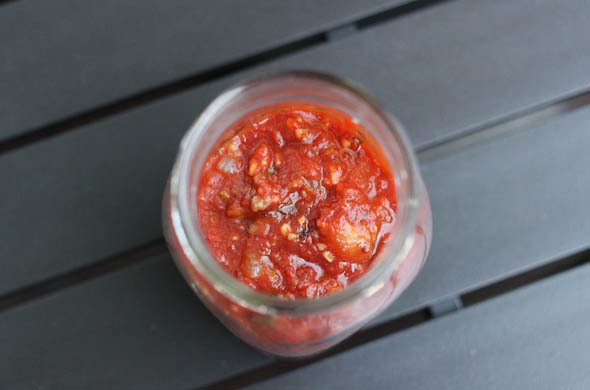 I can see pulling out the sauce for a quick dinner or putting ontop of a pizza or in a calzone! 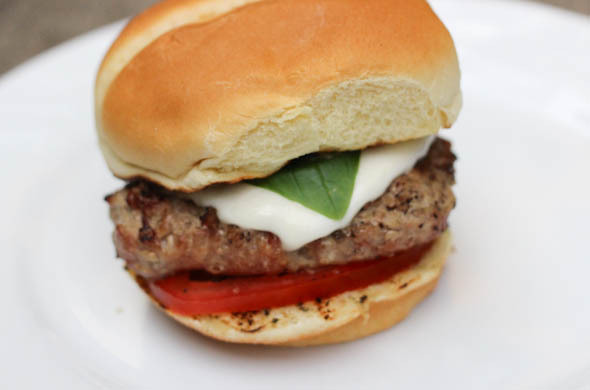 This burger screams summer – as do my flourishing basil plants in the garden! Some critter is munching our tomatoes but the basil on this is home grown! The mozzarella gets melty with a perfect stretchy-gooeyness. I like the hot burger ontop of a cool tomato and plenty of basil for freshness and a touch of creamy yet tart balsamic mayo. I thought about a drizzle of balsamic reduction but went the easy route with some balsamic mayo. Preheat the grill and form the burger patties. Then grill the burgers to your desired cook. Mix together the mayo & balsamic. Slice the buns, tomato, and mozzarella. Toast the buns for the last minute the burgers cook and add the cheese on top of each burger until it melts. 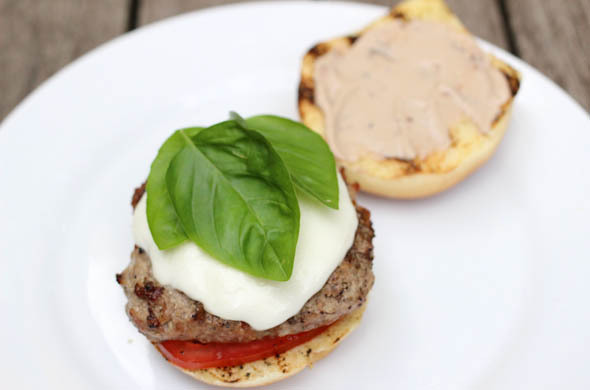 Assemble with tomato on the bottom, then the burger, then basil and a spread of the balsamic mayo on the top bun. I loved this and think it’d be great as a chicken sandwich too. I might even have enough basil for a small batch of pesto. That’d be so great on a caprese burger too!